"They look very dangerous, but iguanas are actually very harmless." The two iguanas were bought to Indore from Mumbai. Huge crowds gathered at a juice shop in Indore, Madhya Pradesh on Thursday to look at a pair of iguana lizards. According to news agency ANI, juice shop owner Raju Sagar paid a whopping sum of Rs 2 lakhs for the exotic pets. The man says he brought the 4.5-foot-long lizards from Mumbai the same day as he was informed. The man, who already has 4-5 lizards as pets, had been wanting to have an iguana as a pet for a long time. "Look at the many designs on it. It is really a miracle of nature," the proud pet owner said. A video shared by ANI shows people flocking to the juice shop to look at the huge lizards. Some even went so far as to pet them, while others were seen clicking their pictures. 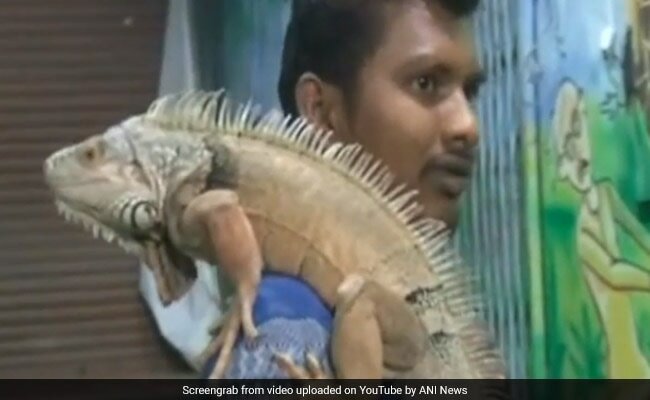 One daring man even held one of the iguanas and let the scaly reptile sit on his shoulder. The owner says the iguanas are harmless despite their scary appearance. "They look very dangerous, but iguanas are actually very harmless. They wouldn't hurt a baby," he said with one of the iguanas perched on his shoulder. "It's a vegetarian and eats carrots, pumpkins, spinach and other vegetarians foods," he says, a statement supported by footage of one iguana munching away at cucumber slices. Iguanas are herbivore lizards native to tropical areas and can grow up to 6 feet in length. Contrary to popular belief, it is legal to have an iguana as a pet in India. Under Indian Wildlife Protection Act (WPA) 1972, it is illegal to own Indian wildlife as pets. The law doesn't extend to foreign wildlife, reports The Hindu.